Google has set out to make its mark on the headphone world with Pixel Buds - wireless headphones that can control your phone and claim to translate conversations in real time. But how do they stack up? Google sent us a pair to review to find out. The most important thing you should know about Pixel Buds is that their full features only work with Google's newest smartphone, the Pixel 2. While they'll function with other phones, you must have the Pixel 2 or Pixel 2 XL (which, buyer beware, have had some early quality control issues) to access the Pixel Buds' marquee feature: real-time translation. To be honest, it's not exactly real-time. You call up the feature by tapping on your right earbud and asking Google Assistant to "help me speak" one of 40 languages. The phone will then open the Google Translate app. From there, the phone will translate what it hears into the language of your choice, and you'll hear it in your ear. So, if you're speaking to someone and they say "Ou est la bibliotheque?" you will then hear "Where is the library?" in your ear. Then, when it's your turn to speak, tap and hold the right earbud to have what you say translated and broadcast out of your phone. The translation feature is promising but not perfect. Translation doesn't happen at conversational speed - this is not Star Trek's universal translator or Douglas Adams's Babel fish. Still, it is much better than a phrase book. While human translators need not fear that they may be without a job, it could be good for travelers or others who want to have a simple, if somewhat halting, chat in another language. That said, needing a translator is not a scenario that's likely to come up for most people everyday. And if you don't have a Pixel? Well, these are far less attractive. Pixel Buds can connect to other Android phones and iPhones but only, essentially, as normal wireless ear buds. On all phones, you can tap your right earbud to call up your virtual assistant - Google Assistant on Android phones, Siri on iPhones. Swipe forward on your earbud to turn up the volume, and back to turn it down. Sound quality is about on par with other Bluetooth headphones I've tried, which is to say not mind-blowing but pretty good for listening to music while doing other things. The Pixel Buds don't skimp on volume; I rarely found cause to crank them above 50 percent. They are comfortable, with a fabric loop that you can adjust to fit into your ear. I completed a workout without them falling out. Pixel Buds are the same price as Apple's AirPods at $159 (roughly Rs. 10,400). Like AirPods, Pixel Buds come with a case that doubles as a quick-charging portable battery, so you can juice them up on the go. The headphones themselves will give you about 5 hours of juice, which you can extend by popping them in the case. I had little trouble getting them to last a full day this way. The main factor in picking between Apple's AirPods and Google's Pixel Buds should be what kind of phone you have. Head-to-head, though, I have three main observations. I like the Pixel Buds's touch-based volume control, which I found more convenient than asking Siri to adjust the volume all the time. On the flip side, the additional controls makes them more complicated than AirPods, both in setup and operation. There's a steeper learning curve in using these than AirPods, and Pixel Buds aren't quite as smart about, for example, pausing when they're not in your ears. 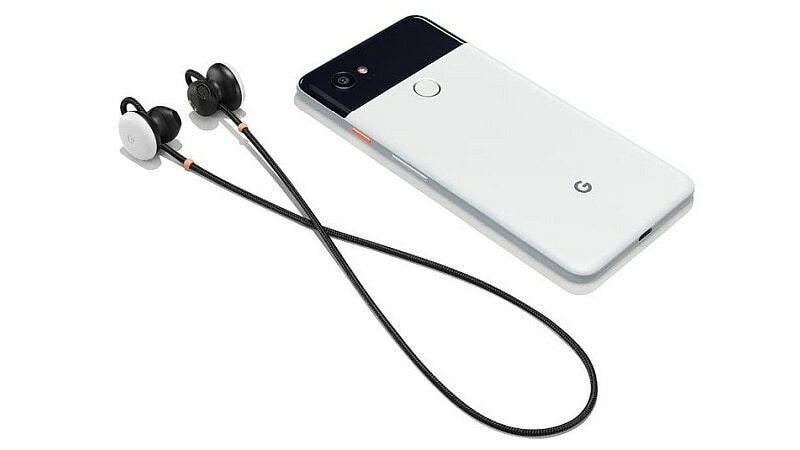 Finally, while Google Pixel Buds don't plug into your phone, they do have a 20-inch cord connecting the two buds. Why get a pair of wireless headphones with a cord? Well, for me, it was a good thing - I could drape them around my neck and not worry about losing one. But if you hate having a cord resting on your neck or want something completely wireless, these aren't for you. Unless you're really in need of basic translation services - and willing to pick up a Pixel 2 - there are better wireless headphones for a more reasonable price. That said, it's worth realizing that the Pixel Buds are more than just a pair of headphones. They're an early illustration of what we can expect from Google, which will try to make products that stand out from the pack with unusual artificial intelligence services such as translation. They also show how Google, like Apple, wants to create products that work best with other products that it makes - and therefore encourage you to pick sides in the technology wars. Neither of those points, admittedly, are necessarily relevant to how well they work as headphones. But both are worth keeping in the back of your mind as Google continues to push out products.